Buying time with bogus bills. I‘m trying to count how many movies I’ve seen that are directly related to the Holocaust. A few major titles come to mind: Schindler’s List, Life is Beautiful, The Pianist. Sophie’s Choice. But there are dozens, aren’t there? Maybe hundreds. I understand why. While heroes make you care about a story, the only measure of a hero is the measure of the villain. And certainly there are no villains who quite measure up to Hitler and his cheerful Nazis. Lesser demons like Stalin or Pol Pot made a run at the title, but neither could match the pure malevolence, the genocidal glee practiced by the Third Reich. I’ve always thought that the Nazis killed not so much out of Aryan stupidity or political expedience, but simply because they could. That’s evil. 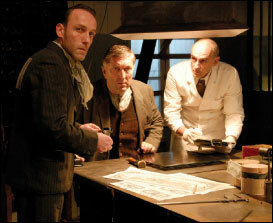 Last night I watched another Holocaust movie: The Counterfeiters, a 2007 film based on real events (God, how I hate that phrase) involving a group of Jewish concentration-camp prisoners tasked with producing enough fake currency to destroy the British and U.S. economies during the closing days of World War II. We know how that turned out. Still, and even though The Counterfeiters has the least-likable protagonist since Al Pacino in Godfather III, it works for precisely the reason I just mentioned: put Jeffrey Dahmer against the Nazis, and you’ll be rooting for Jeffrey Dahmer. As master counterfeiter Saloman “Sally”Sorowitsch, Karl Markovics is no Jeffrey Dahmer, but neither is he somebody with whom you’d necessarily want to have lunch. He’s expressionless and cynical and he’ll do pretty much anything to gain another day on the planet. When he clashes with a fellow prisoner who believes it’s better to die now than buy time by helping the Nazis, the story gets interesting. That choice — dying pure now or dying corrupt later — can seem simple to those of us who view the Holocaust from the comfort of a couch. But it’s still a pretty compelling plot device. Can we blame the ones who bargain for just a little more time? While The Counterfeiters risks cliche by coming this late to a crowded genre, it still works on the strength of its actors and script — and the enormity of the evil its protagonists face. The film is in German, but as a man with degraded hearing I’ve grown used to subtitles anyway. Dave Bob says check it out. Would you mind shutting the hell up?